Citrus, Clean, Fresh. 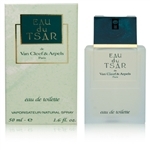 Designed by Van Cleef & Arpels in 1998, Eau De Tsar for men is a refreshing, fruity fragrance. It's fragrant nature explores essences of pineapple, watermelon and thyme. Blended with notes of lavender, patchouli, sandalwood and oakmoss, Eau De Tsar is a sporty fragrance.